To screen all children on entering school at age 5 to ensure that none ‘slip through the net’ and to provide baseline data for school records. To ensure that any child who may turn out to be dyslexic has had multi-sensory teaching for 2 years rather than waiting to be diagnosed at the age of 7 and then having to start from the beginning again. The idea of the Five Minute Box as an early intervention and screening tool, grew out of years of experience with primary age children who had failed to master the art of reading and spelling, and who had become disenchanted with the process of learning. By Junior School age, these children needed regular extra teaching and often needed to use expensive resources to motivate them to acquire the skills. Withdrawing children from lessons to teach them basic skills meant that they were missing subjects that they enjoyed. Early detection of Dyslexia or general learning difficulties means that support and meaningful teaching can be put in place before a child begins to miss out on the teaching that is going on in the Early Years stage of his education. For any child to succeed they must have good self-esteem, and be taught self-help strategies that will carry them through the years of learning ahead of them. 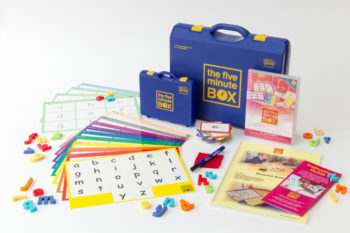 The need for simple steps learning, linked to a regular, consistent, multi-sensory style of teaching is behind the development of the Five Minute Box. Used from the age of school entry, the programme of teaching has been designed to cover the basic skills for the acquisition of literacy. It is designed for use by Learning Support Assistants on a daily basis and requires nothing more than time. Although the basic skills needed by a child to learn to read and write are covered in all Reception classes, there are always a group of children who struggle with the pace of learning. This may be due to dyslexic type difficulties, or to a slower rate of learning. It may be due to a child having had absences from school for illness. The Five Minute Box is designed to supplement the teaching of these skills by giving as much time as each child needs to acquire them. The skills are separated into different areas, so that a child can make progress in one area, while still being allowed time to completely master another area at a slower pace. Motivation, organisation and self-help strategies are built in to the programme. The recording of progress is shared each session with the child, and progress is divided into small ‘milestones’. These stages can readily be shared with parents and are easily monitored by the SENCO/ Inclusion Manager and class teacher. Structured ‘Wave 3′ support for Literacy Difficulties from Reception onwards. Support that can be provided by Teaching Assistants and monitored by SENCO. Easily accessed record keeping and no time wasted on photocopying resources. Knowledge that all children will have complete early phonic knowledge and be able to read numbers. ‘Box’ time is flexible – can be either arranged to fit in with the daily timetable as a regular slot, or used to fit in any extra time available. All children go on to the Box on school entry – the more able do so rapidly, others remain and continue support as long as is necessary. Teaching Assistant time with the Box is structured and does not need daily planning by teacher. Minimal training is required – an instructional CD is included and training sessions in school can be arranged. Teaching Assistants have ownership of provision and progress – providing a valued role for them. Children giving cause for concern can be easily referred to SENCO. Parents can be involved at an early stage using easy to follow tasks for ‘homework’. 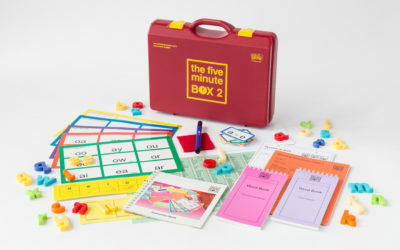 Box activities allow children to share what they have learned rather than expecting parents to teach them. Additional routine practice is beneficial to children. Progress through The Box is easy to report to, and share with parents. Support from home is important for children. Children are encouraged to share successes. Benefit from 1:1 time on a regular basis – ensures against children failing. All-important self-esteem is maintained as children see progress on record card and are aware of progress through small steps targets. Routine is rapidly learned so children work with confidence. Self-organisation skills developed. Suitable for Autistic Spectrum children as the routines are entirely predictable. 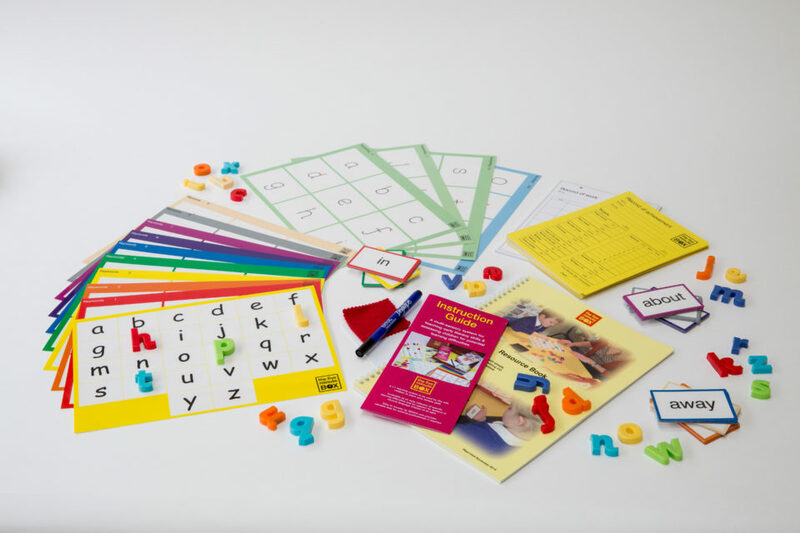 Allows children to gain secure phonic knowledge and literacy skills at their own pace. Good tool to recommend for early intervention before the need for an assessment. Gives accurate record of progress over time, rate of progress, amount of progress, identifies areas of relative strengths and weaknesses. Plus the designer of The Box at the end of the phone to answer any questions! The Sounds Board and Keyword Boards are photocopiable so they can be used at home. 1. Why are there different ‘a’s in the Box? Children come across many forms of letters daily – handwritten, printed in books and on the computer. Children never query the different forms and I have never known a child try to copy the ‘a’ form when asked to write the keywords. 2. Which age group is the Box suitable for? All at Reception / Year 1. Ongoing through years 2,3,and 4 for dyslexic children and MLD childen. It is excellent as a quick start for second language children who arrive in school at any age. It has also been used as a complete new start with some secondary age children. Recently it has been enthusiastically used by the top group pre-Reception children in Nursery. 3. Is it really only five minutes a day? Yes it can be, and five minutes a day 1:1 is far more valuable and beneficial to a child than 20 minutes a week. 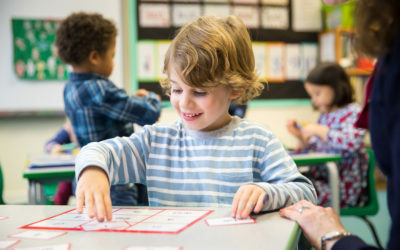 The sessions can focus on the sounds board one day and keyword cards the next if there are only a few minutes available – a trained SEN teacher may use it for up to 30 minutes. 4. How long does it take to train Teaching Assistants? Watch the 20 minute CD, familiarise themselves with the contents, open the Box and go! 5. Why don’t the letters on the handwriting boards have ‘lead-in’ strokes? ‘Lead-ins’ are not, in fact, part of the basic letter shape, they merely take you to the start of each letter. Children who need extra practice to form the root shape of the letter accurately, can be distracted by the lead-ins. As the boards are wipeable, the lead-ins can be added with the white board pen by saying “Start on the line and take me to the start point…”. 6. Why is there not a magnetic board to use with the magnetic letters? It was originally magnetic, but children were too easily distracted by dropping the letters to make a nice ‘clicking’ sound! Also, letters need to be able to be slid quickly between words or back into their position in the rainbow, and using a magnetic board makes this more difficult. 7. 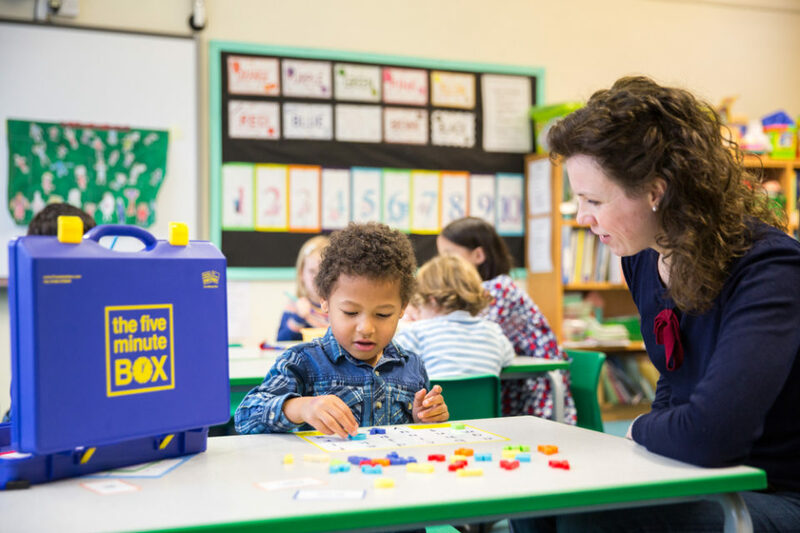 We use Jolly Phonics at school – can the Box be used alongside this? Absolutely Yes. It was designed to work alongside any phonic scheme, or handwriting scheme. It is the basic phonic knowledge but taken at a pace chosen by the individual children, rather than having to keep to the prescribed route through the commercial schemes. It allows for them to continually consolidate what they know and reinforce what they are learning in class lessons, without assuming they will remember everything! 8. How long do children stay on the Box? Quicker learners, who may have learned early skills at home, can be through and out of the Box in a matter of weeks. It gives an opportunity to ensure that they have accurate phonic knowledge which they can use later as spellings become more difficult and ensures that their handwriting is going to be efficient and fluent. 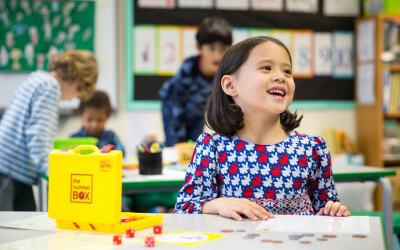 Other children, who find learning difficult, may stay on for anything up to 2 years – and continue to ‘open the Box’ with as much enthusiasm as when they started. The majority of children are secure by the end of Reception, 5 or 6 per class going into Year 1, and only 2 or 3 needing it beyond that. 9. How many Boxes do we need? Ideally, 1 for each Reception and Year 1 class, then 1 available for ongoing children into Years 2 and 3. It works best if each Teaching Assistant is responsible for her own Box, and can take advantage of any time that is available in the class without having to search other classes for it. For as long as you need to continue to use it! All items can be replaced free of charge if lost or damaged, and there are photocopy rights given for the baseline sheets, recording booklets and inserts, and the word and sounds board for homework use. The original hand made versions have been in use for 10 years now and are still going strong!